An actual "circle" of women. We were practicing neck massage at Birth Boot Camp instructor training in Indianapolis! The birth world is an incredibly interesting place. All kinds of women come together because of their passion for birth to work as doulas, midwives, childbirth educators, placenta encapsulators, and more. You would think that being involved in the momentous occasion of birth would mean that all of these women are perfectly perfect, or at least kind and loving. You would be wrong. Sometimes this circle of women feels more like a firing squad than a loving drum circle. I think any birth worker notices this once they get involved enough and it is really disappointing. So much so, in fact, that I think some even end up leaving birth work altogether in order to avoid the drama. Lately, I have been wondering a little about all this back room back stabbing. It has made me feel a little disappointed and hopeless. But last week I went to another Birth Boot Camp childbirth educator training. 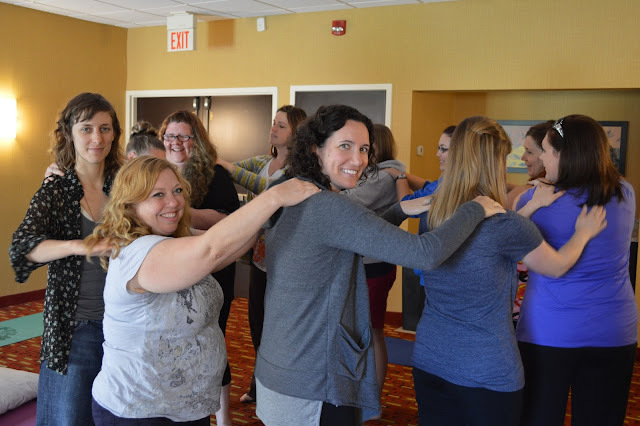 I, along with my boss, Donna Ryan, spend four days with a new group of women every few months and try to communicate the skills necessary so that they too can go out and make a positive difference in the lives of women and families in their communities. As usual it was a really beautiful experience. There are so many things I love about it. I love that more than a dozen very different individuals from all over the country can join together to learn and truly feel as one. I love that our differences seem to disappear as we share our passion and focus on what matters: children, family, babies, birth, and women and their innate power. I love watching the outside "junk" disappear as each person lets their own true self shine through. A fun weekend of training is always life affirming for me. But it is also so much more. The things that are built when birth workers actually work together and show kindness and grace are more than good memories and late nights. We are building an incredible community of support that crosses borders both geographical and political. Recently my brother had his first baby. I wasn't able to be there since they live far from me and my own work and family is demanding. Yet I wept tears of joy knowing that they were supported by women in their own community who I knew, loved, and respected. They took a childbirth class from a woman that Donna and I had trained. They hired her as their doula. They were supported by midwives. They were filled with their very own knowledge and confidence. I KNEW that this baby was surrounded by goodness and good people when he made his own entrance into the world in a peaceful and joyful moment. I can't even express to you how much this means to me and how much happiness and inner peace it brought me. This- a circle of women who support birthing couples and fresh, squishy babies- is what we can create when we truly work together as birth workers. We can have a friend or family member across the country who needs support and we can find someone we trust to help them meet their goals, when we learn to work together. I am so grateful for this. It has restored my faith in humanity and in the birth community itself. And I see it happen all the time with our instructors and doulas. We are doing a great work and when we work together as professionals, we do an even greater work that touches and improves birth for even more women. We can do this. We are doing this. And it is amazing. This is how you make a difference in the world. This is how love wins. I don't think I would have said that any better!